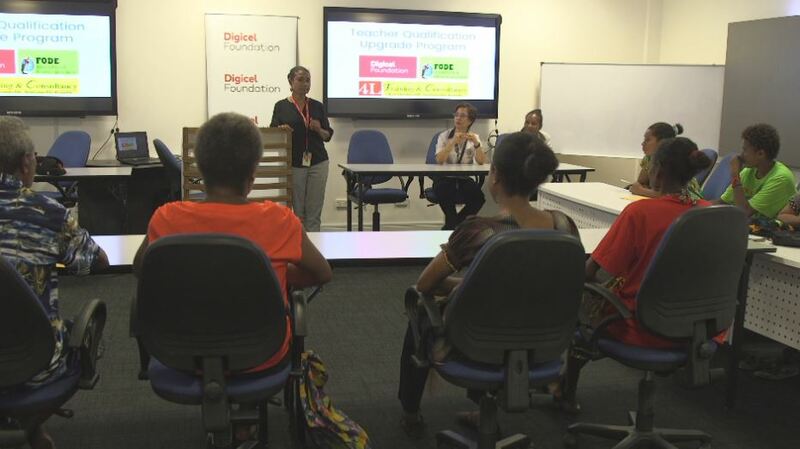 Twenty individuals taking up Digicel Foundation’s ‘Teacher Qualification Upgrade Program, sat through their orientation on Tuesday, with program partner the Flexible Open Distance Education (FODE). The T-Q-U-P is an extension of the foundation’s CLC TISA Program aimed at helping aspiring teachers attain their Grade 12 certificate, so that they can be eligible for tertiary teacher training. The foundation says the T-Q-U-P will address a number of issues, including helping these teachers get on the government’s payroll system. The 20 individuals are the final lot of 299 teachers taken under Digicel Foundation’s CLC TISA program. They will undergo two years of study under the ‘Teacher Qualification Upgrade Program’ with FODE program. The students, mostly Grade 10 drop outs, were nominated by their respective provincial education departments. They’ve signed a 70/30 partnership with Digicel Foundation, where the foundation pays for the bulk of their tuition to study with FODE – they put up the rest. “Most of them are grade 10 drop outs,” said Adi Anaseini Vesikula – Chief Operations Officer, Digicel Foundation. “They’ve been selected to take up this extension program of the CLC TISA Program before we just train them and send them out. The foundation has taken on board a number of issues which include qualification of teachers and schools – which amount to financial support for teachers, and students who are well taught, to be able to lift the standard of education in PNG. Deputy Principal Curriculum for FODE Dr Janet Subagan-Mondez said the students only need to bring to the table their commitment to two years of studies. “They just have to give their time and all their efforts so they do well for next two years of study with FODE, to get that Grade 12 certificate,” said FODE Deputy Principal Curriculum, Dr Janet Subagan-Mondez. She said FODE is distance so the students have to allocate time to each subject book. After they complete their assessments and submit to respective provincial education departments, the feedback will help them move on to other subjects until they complete all modules for six subjects.